Jackass Flats is a great end of the day route. It is a fun two-pitch jaunt up okay rock with a quick descent by rappelling into the bottom of the Diet Delight descent gully. 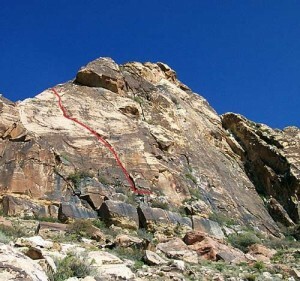 A long hand crack in mediocre rock on the second pitch is the highlight of the climb. Which SuperTopo guidebooks include a topo for Jackass Flats?